The No. 7 Virginia field hockey team (13-4, 3-3 ACC) closed out its regular-season slate with a 2-0 shutout victory at No. 17 James Madison (12-5, 5-0 CAA) on Friday (Oct. 30) at JMU’s Field Hockey Complex in Harrisonburg, Va.
Sophomore Tara Vittese (Cherry Hill, N.J.) scored both of Virginia’s goals. Goalkeepers redshirt freshman Carrera Lucas (Brooklandville, Md.) and junior Rebecca Holden (Fishing Creek, N.J.) combined for their fourth shutout of the season with Lucas making four first-half saves and Holden stopping five second-half shots. Freshman Izzy McDonough (Kennett Square, Pa.) also made a defensive save. The game was scoreless through the end of the first half. Vittese scored off a penalty corner 1:11 into the second half to get the Cavaliers on the board. Vittese added a second goal eight minutes later, tapping in a loose ball in front of the goal after a save on an initial shot from senior Taylor Brown (Charlottesville, Va.). Looking for one last offense push, JMU pulled its goalie with 3:32 remaining, to gain an extra attacker, but the Virginia defense held, preserving the shutout. The Dukes outshot Virginia 9-4 in the first half and 19-13 overall. The Cavaliers finish the regular season with a 13-4 mark, including a 10-1 non-conference record. The post season begins next week for the Cavaliers when they host the 2015 Atlantic Coast Conference Field Hockey Championship Nov. 5-8 at University Hall Turf Field. 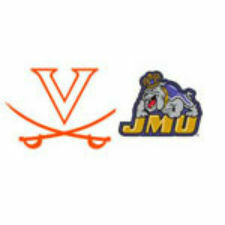 UVA, the No. 4 seed in the tournament, will play in the very first game, taking on fifth-seeded Duke (11-5, 2-4 ACC) on Thursday, Nov. 5 at 11 a.m. The winner will take on top-ranked Syracuse on Friday, Nov. 6 at 1 p.m.
Tickets are on sale for the ACC Tournament. All seats at Turf Field will be general admission with adult tickets priced at $5. Tickets for youth 18-and-younger are $3. Children two-and-younger and students of participating schools are are admitted free. Ticket sales on game day will be CASH ONLY. The ticket office and gates to the field open one hour prior to the start of the first game each day. Fans can purchase advance tickets online at VirginiaSports.com, in-person at the Virginia Athletics Ticket Office in Bryant Hall at Scott Stadium or over the phone at 1-800-542-UVA1 (8821). Parking will be free at the nearby John Paul Jones Arena surface lot and, space permitting, at the University Hall and Cage lots adjacent to the field. More information about the championship is available at theacc.com.